Newquay looks back on 1600 years of history and a dramatic change of identity from fortified cliff settlement, through tiny port to premier resort. Iron Age Man smelted ore here for weapons and tools, Industrial Age Man made it his conduit for the trade in tin and china clay, but Modern man found its hidden gold; the chain of eleven beaches that have transformed Newquay in less than a century into the most popular resort in Cornwall. 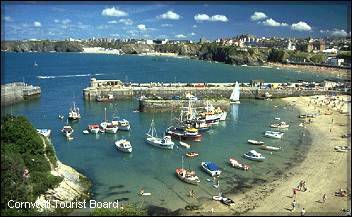 Because of its position at the heart of Cornwall, Newquay makes the perfect touring base to explore its history and legend. To the north-east is Tintagel where Merlin wove his spells and King Arthur held court. To the east is Roche Rock, spiritual home of the Cornish Gorsedd and the wildly beautiful moorland of Bodmin. And south is the 11th century Restormel Castle, one-time home of the Black Prince, the beautiful valley of the Fowey and the lushly different riviera of sleepy estuaries, secluded coves and picturesque fishing villages like Mevagissey. Sixteen hundred years ago all that existed within the modern boundary was a settlement on Porth Island. You can see a reconstruction of the inhabitants' lifestyle, hunting and iron-mining methods in the Tunnels Through Time exhibition in St Michael's Rd. In 1439 Bishop Lacey of Exeter allowed the burghers of what was then called Towan Blistra to build a New Quay. It was the beginning of the towns second life as a fishing port culminating in the arrival of the great pilchard shoals of the 18th century and the galvanising cry of "Heva !" from the whitewashed Huer's Hut, still standing above the harbour. When the pilchards went, the Industrial Revolution came, turning Newquay from a fishing to a commodity port loading tin, lead and china clay. The famous six-oared gigs you can watch in harbour races originally competed to put pilots on board incoming vessels. In the seventeen and eighteenth centuries, low wages from fishing and agriculture were supplemented by smuggling and more sinisterly the "wrecking" made famous in Daphne du Maurier's Jamaica Inn. 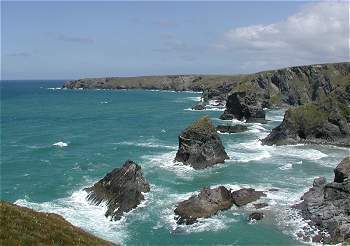 Crantock hid many a cargo of silks, spices and brandy from the Revenue Men, and wreckers used to swarm from the villages of St Columb and St Mawgan at news of a ship in difficulties near the jaws of rock called the Bedruthan Steps. Cornwall has its own language with a 2000 year tradition and close ties with Welsh and Breton. As late as the 18th century peasants resentful of English ways and taxes would say "My ny vynnaf cows sawnsek" ("I will not speak English"), but now the language is heard only in bardic revivals of verse or plays in Plen an Gwary - open-air theatres.